Almost 15 years ago I set up my first multiple monitor system, using a 17” and a 15” CRT. At that time it was a very uncommon setup, but now it seems that many people use multiple displays to manage their workspace. No matter how many displays you hook up, there are always some things that benefit from having a single, large, high resolution desktop, such as the spreadsheets that I use for doing display reviews. 27” and 30” displays with 2560 horizontal pixels have been available for a few years now, though the pricing on them has been very high that whole time. Sometimes you can find a display on sale and pick it up for a reasonable price, but typically the cost of entry seems to be right around $1,000 and up. Because of this people are still likely to buy two, or even three, 1920x1200 displays for the same price and run a multi-monitor desktop. 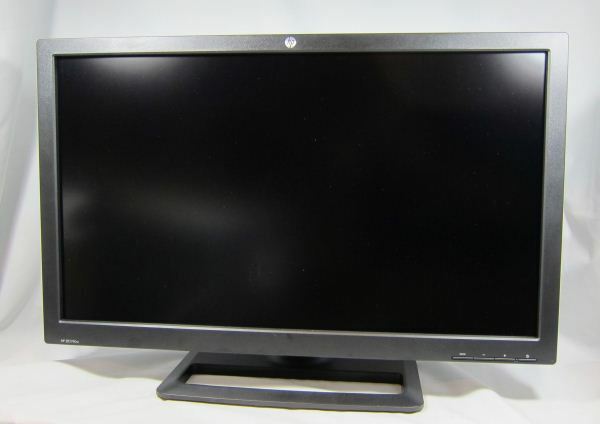 We finally have our first real affordable 27”, high resolution display on the market now, and it comes courtesy of HP. The HP ZR2740w is a 27” IPS panel with 2560x1440 resolution (16:9 aspect ratio) and an LED backlighting system. With a street price that comes in at $700 or below, what has HP done to be able to bring a high resolution display to the masses at a price well below other vendors? Thankfully, they provided me with a unit so I could evaluate it and see. Since my usual desktop monitor is a lowly 20” Dell widescreen, unpacking and throwing the HP on my desk in its place was quite a difference. I was pleasantly surprised to see that the HP still has a stand with tilt, swivel, pivot, and height adjustments. When 24” monitors that are value priced, or even $300, are leaving these out it is quite nice to see on a value priced 27” display. The front of the display has four buttons: Power, Brightness +/-, and Source. Once you look for the inputs to hook the display up you get your first clue as to how HP shaved the price on this display. The only inputs available are a Dual-Link DVI and a DisplayPort. For people that want to use their monitor for gaming or watching movies, there is no HDMI port available. With no HDMI port, there are also no speakers in the HP either. I was a little bit surprised that they still have the standard USB 2.0 hub with four ports available, as that seems like another item that could be cut to save a bit on costs, but I was happy to have it available. Once you go to adjust the brightness, you’ll notice something about the OSD on the HP in that there isn’t one. There is no menu system either. The only adjustment available to the end user is a single brightness control that has no on screen setting. There is also no LUT inside of the monitor to help for correcting the color, but that wasn’t much of a surprise either. With no OSD, there are no color presets, no dynamic contrast or enhanced response modes, nothing beyond what you have as a standard. There is also no way to control the aspect ratio so if you feed the HP with a signal other than 2560x1440 you will have it scaled automatically and there is no way to adjust that. Because of this lack of an OSD, having the necessary hardware and software to perform your own calibration might be a little more important with the HP. In a sense, it's a bit of a throwback to the early 30" LCDs, except now there's a DisplayPort connection in addition to the DL-DVI. Despite the loss of all these features, the HP does have the specs that many of us are looking for: 2560x1440 resolution and an IPS panel that is listed at supporting 10-bits per pixel with A-FRC (8-bit native), and has a native gamma of 2.2. It only has a standard gamut LED lighting system, so it is listed as being able to do 99.9% for the sRGB color gamut but only 77.2% of the Adobe RGB gamut. For many users, that's actually not a problem and could even be seen as a plus. (High gamut displays running sRGB content can sometimes look oversaturated if your applications aren't color space aware.) So now that we have an idea of what HP had to do in order to hit this price point, did the performance suffer from these choices? Here's a quick overview of the specs and then we'll get into the evaluation portion of the review. Dimensions w/ Base (WxHxD) 25.4" x 9.3" x 21.26"
Despite the large panel, viewing angles are very nice on the HP as you can see. To see much of a brightness shift you had to be very far off angle, and I had no issues at all with normal use. They talk about how expensive these monitors are to make but that seems like so much smoke and mirrors. As far as I can tell these monitors have by far the highest margins on them of any type of monitor.